Have you visited our other location? Are you looking for some unique flavors? Are you a fan of smoked meats and jerky? Come and visit us! We have an assortment of different items you can sample. Cartwright’s Market makes jerky and pepper sticks and smokes meat including turkeys and hams right here. We also make our own fresh deli meat and bacon. If you crave a meaty treat, try our homemade sausages. We offer German sausages, dinner franks, old fashioned frankfurters (yummies), Polish dogs, pepper jack dogs, smoky cheddar dogs, beer sausages and hot sausages. Our bone-in and boneless hams are available year round. Our spiral glazed hams and whole, smoked turkeys are available during the holidays. 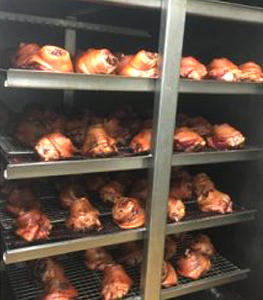 Our smoked meats are made on site with only the freshest and highest quality ingredients. You will love the difference quality makes! © 2019, Cartwright’s Market. All Rights Reserved.